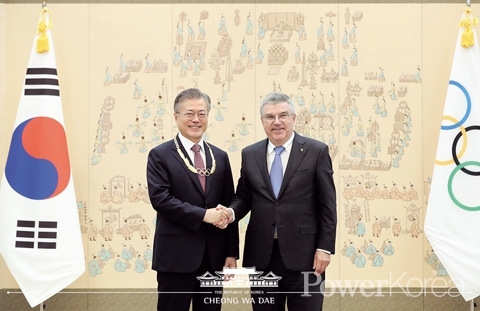 President Moon received Olympic Gold Order from the IOC on August 30 from the IOC president Thomas Bach at the Blue House. First started in 1975, the Olympic Order goes to those who made contributions to Olympic Games. Moon is the 4th president to receive the order after Kim Young-sam in 1993, Kim Dae-jung in 1998 and Lee Myung-bak in 2013. Moon said "I and Bach agreed to include North Korea to turn the PyeongChang 2018 as an Olympic of peace. Bach then allowed the Unification Flag and participation quarter for the North Korean team. Thanks to this kind arrangement, we made the PyeongChang 2018 as a great success." Bach said "I came here to thank you for unsparing support and cooperation for the success of the PyeongChange 2018. I actually doubted whether I could possibly draw participation of the North and now I believe you've done more than enough to receive this order." Moon presided over a meeting with 17 provincial governors and city mayors held on August 30. 40 high ranking public servants including Prime Minister Lee Nak-yeon discussed on the current low employment rate and job creation which were broadcast live. Moon said "Greater part of the next year budget goes to job creation. To make this budget worth spending, we must closely work together. It is also important for the local government to have more control over running the budget according to their own environment and conditions." All 17 local governors and mayors brought up their own policy plans and presented on the day. The meeting brought up a measure that the local government leads the planning and the central government supports through horizontal and bottom-up communications. They also agreed to hold this meeting quarterly. Moon agreed with the quarterly meeting but suggested that the gathering should not be physical but video meeting can also be a good alternative.